In August, I went to the Metropolitan Museum of Art for the first time. After living in New York City for 2 years, I think the trip was long overdue. While we were there, we visited the exquisite Heavenly Bodies exhibit before exploring some of their European Art sections. 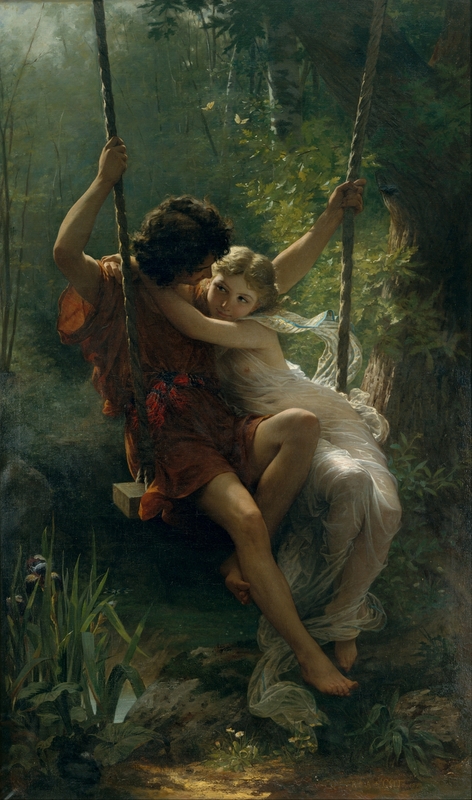 In a spot I’m not sure I can find again, we found Pierre-Auguste Cot’s “Springtime” painting – where I fell head over heels in love. The inspiration from the painting prompted me to challenge myself and create my own version. I’ve always had a bit of a complicated relationship with museums. My dad liked to take me when I was little; I think he was waiting for my creative genius to blossom. Unfortunately for him, my art blossomed the way most peoples’ art blossoms: by putting in long, hard hours. As a child, museums bored me. I had a difficult time appreciating all of the artwork carefully restored, grouped into themes, lovingly hung up onto white walls. Now that I’m older, I understand museums so much more. Unfortunately, I still have issues with finding inspiration in one! I tend to self-deprecate while I’m there, weighing where my art stands against the giant pieces that adorn the walls. I often think about the unfortunate consequences that created museums in the first place – the pillaging of other cultures, the hoarding of beautiful items by Europeans into sparse and singular spaces, slapped with entrance fees to keep the average person out of places meant for the cultured and the wealthy. In my heart, museums are a source of conflict for me. I love art and I love seeing beautiful art, but museums end up feeling stifling to me instead of inspirational. Once in a while, however, I see a painting in a museum that forces me to change my worldview. Once in a while I see a painting that takes my breath away, that makes me stop and stare and feel like I could sit and look at it for forever. A few years ago, it was Paul Signac’s Pink Cloud painting; before that, it was Van Gogh. It’s just like me to have a tendency to fall deeply in love with impressionist paintings, a style that I do not and cannot replicate. Based on my previous art loves, it makes no sense that I would fall in love with this one. It’s not done in an impressionist style, and it’s not even painted by an artist that I immediately recognized. I can’t even really explain why I was drawn to this painting. 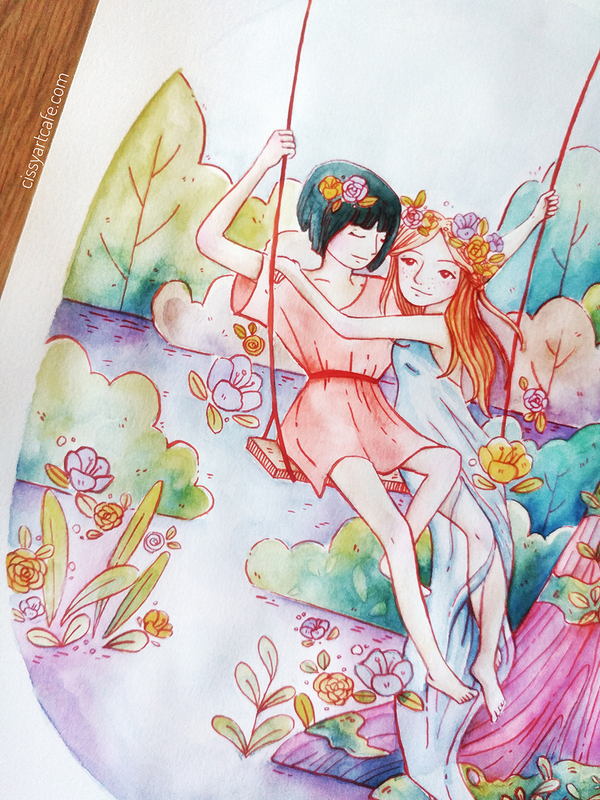 Lovers are a common subject in a lot of paintings, so it’s not that this one was really special, and swings are so classic they’re almost cheesy. And yet, the adoring look in the gaze of Cot’s young girl is captivating. I have known that look. That look has graced my own face as I look at the people I love. I think everyone has felt it and seen it, and perhaps that is the exact reason for why I think this is such an extraordinary painting. When I saw this painting, I immediately saw my own version of it in my head. That’s literally never happened to me in a museum setting before. That image in my head stayed there, waiting patiently for a month before I could finally sit down and sketch it out. Despite my general dislike for drawing stylized people (because I don’t think I’m very good at it), I’m really proud of how my painting turned out! I think that despite making obvious stylistic and compositional changes, it still echoes the original while having my distinct style. Can you tell that I’ve been really loving floral elements and red outlines lately? This painting ended up being pretty challenging because it included a lot of elements I wasn’t fully comfortable with. 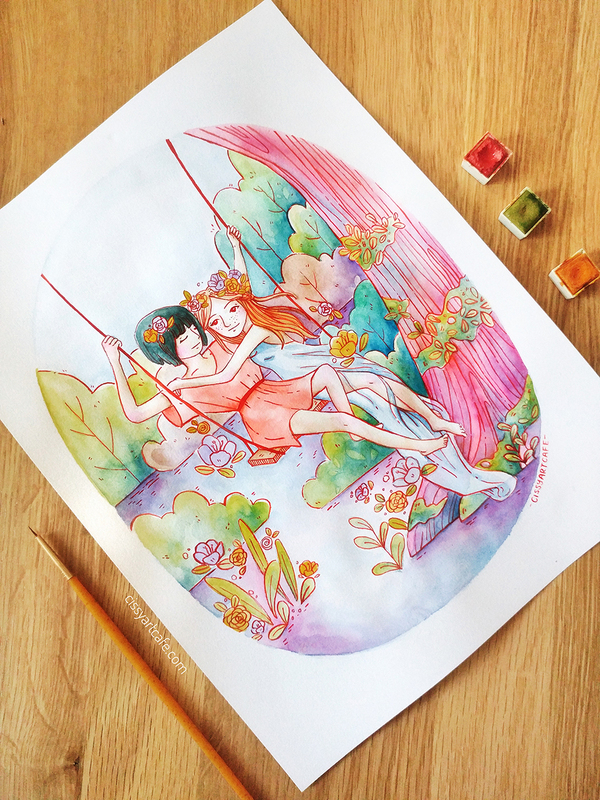 I knew before I started the sketch that I wanted the people to be two girls with flowers floating around them, but I wasn’t exactly sure how the girls would look. Since I don’t usually draw people, my skills felt pretty rusty! I actually looked back at my Mermay paintings, especially Neville, to get a feel for how I wanted to paint my girls. It was also one of the largest watercolor paintings I’ve done recently, and required a lot more detail work than I was used to! Most of my watercolor paintings are pretty small because I find doing large washes of color tedious and annoying, but I knew with all the detail I wanted for the piece, I would have to go bigger. 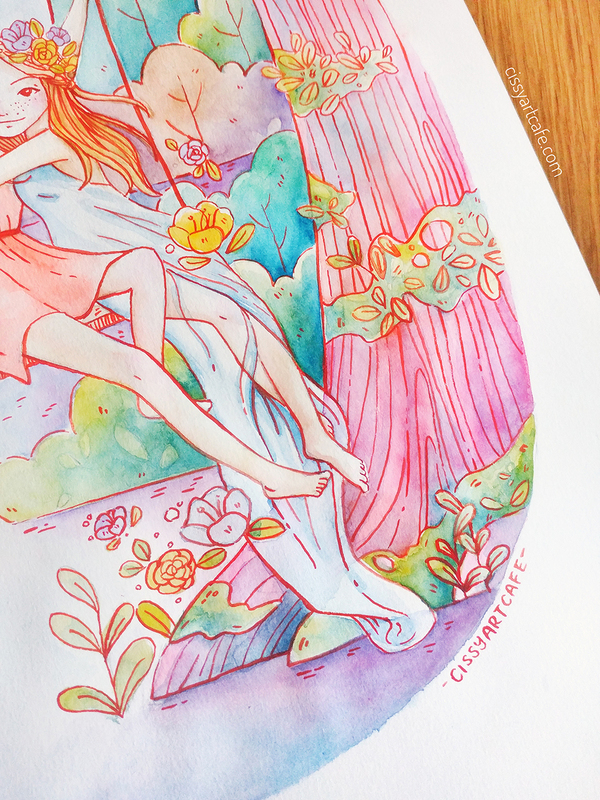 This final piece is 9″ x 12″, which is still not that big, but nearly twice the size of most of my paintings! One challenge with the size is that my trusty Canson mixed media paper warped a little more than usual. I was able to work around it, although I think I will go for thicker paper for my next larger watercolor painting. I was also able to practice my painted linework with my tiny brush and favorite red watercolor paint, especially on the tree trunk. Those lines were super fun to paint! I am so, so pleased with how my painting turned out, so I’m offering it as a print in my shop at the regular sizes of 5″ x 7″ and 8″ x 10″! I hope you love this painting as much as I do. Now that you know what I’ve been up to, I’d love to know: what have you been working on lately? If you’re interested in more Paint With Me-type content, I have two more Paint With Me videos linked in this blog post. And if you want to see more of my stylized people, check out my Mermay post! P.S. Check out my Youtube channel – it’s new, and I’m having so much fun making videos! I’m hoping to invest in a better camera phone soon, and eventually, a fancy camera. Fingers crossed!